March 27: Samuel Houston Weatherly was born to Wright and Ann Bryant Weatherly in Madison County, TN. September 6: The U.S. Federal Census enumerated in Denmark, Madison County, TN showed 13-year-old Houston living with his parents, Wright and Ann, and his siblings: Caroline, Mary, Robert, William, Rufus, Wright, Nancy, John and Alexander. His father was a farmer and owned $1000 in real estate. July 9: The U.S. Federal Census enumerated in Denmark, Madison County, TN showed 23-year-old S. H. (Samuel Houston) living with his parents, Wright and Annie, and his siblings: Robert, Mary, Bettie, Nancy, John, Richard and Alex. His father was a farmer with $3000 in real estate and owned 3 slaves. May 15: Samuel Houston Weatherly and his brother Robert enlisted in the C.S. Army in Jackson, TN. They both mustered into Co. K of the 6th TN Infantry. May & June: Company Muster Roll. Present. Listed as 3rd Sergeant. March & April: Company Muster Roll. Absent. Remarks “Detached Rome Ga.” Later documents state he was on guard duty at a hospital when he was detached. July 8: Four more of Houston’s brothers, Wright, William, James and Rufus, joined the Confederate Army in their hometown of Denmark, Tennessee. They muster into Co F 14th Cavalry. Enlisting might not have been voluntary, during the summer of 63’ Gen. N. B. Forrest was conscripting soldiers throughout West Tennessee. November 25: Both Houston and his brother John fought at the Battle of Missionary Ridge. 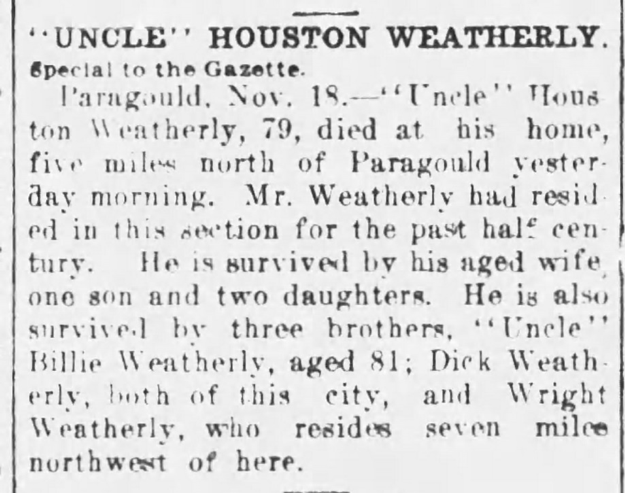 John Weatherly was killed in action. November 30: Houston and at least 4 of his brothers foght in the Battle of Franklin. Brother, James was killed during the fighting. December 16: Boss Weatherly, Houston’s cousin, was captured while fighting in the Battle of Nashville. He was taken to Camp Douglas in Chicago. May 31: Appears on a roll of prisoners of war paroled in Brownsville, Tennessee. Samuel Houston Weatherly married Martha Ann Valentine. Martha was the sister of his brother James’ widow Mary Jane Valentine Weatherly. Houston and Martha moved to Greene County, Arkansas where he bought a 240 acre farm. June 2: The U.S. Federal Census enumerated in Friendship, Greene County, AR showed S.H. (Samuel Houston), a farmer, and his wife Martha living with their 6 children. Also living with the family are 2 boarders. An interesting note is Houston was listed as suffering from consumption. November 17: Samuel Houston Weatherly died and is buried in the New Friendship Cemetery in Paragould, Arkansas. November 19: Daily Arkansas Gazette.